Lak Lakshmanan is a Big Data & Machine Learning Tech Lead at Google. We had the opportunity to talk to him about the new Machine Learning on Google Cloud Platform Specialization that he helped develop. 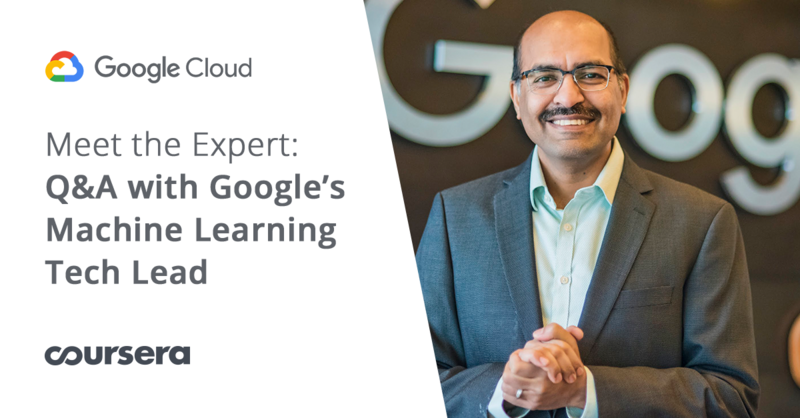 Read on to get an inside look into what you’ll learn in the specialization and why machine learning on Google Cloud matters to you. Why was the Machine Learning on Google Cloud Platform Specialization created? Originally, our plan was to develop a single course on machine learning, as part of the data engineering specialization, which walks through a machine learning problem end-to-end– from data exploration to training, evaluating and deploying a machine learning model. However, after the first course was released, we received many questions that were broader than how to write a machine learning model and train and predict with it on Google Cloud Platform (GCP). Questions like: How do you design the software for a machine learning (ML) problem? How do you setup and manage a ML project? How do you build a data pipeline? When do you retrain a ML model? What knobs should you tweak to improve your model? We then realized that we needed a specialization on machine learning, one that could go broader and deeper into machine learning, demonstrating how it actually works in practice through multiple courses. Who should be taking this course, but might not think it’s for them? Myself, but with hair! Seriously, though. I’m thinking of newly minted graduates. I sometimes have younger data scientists, both from Google and from our customers, asking me what topics they need to learn more about. Probability theory? VC dimensions? Capsule networks? My advice is that the real world is very different and more complex than synthetic problems. The challenge will often be of formulating the problem correctly, figuring out issues lurking in the dataset, and getting to a ML solution. New graduates who have learned ML in college can learn a lot about practical machine learning from a course like this. Is there a specific topic in the specialization that most excites you? Not one topic, but something that happens over and over again in the specialization. We’ll take a hard problem. Create a benchmark that is very reasonable and then start building ML models. And the benchmark will prove difficult to beat. So, we’ll add tricks. We’ll add new techniques. Chip away at the problem and learn practical tips along the way. And then, voila. Suddenly, amazing performance. The benchmark’s beaten, but there is still room to improve. I love those moments. We build a lot of ML models in this specialization, and I love those times when our hard work and grit is rewarded by superior performance. Why is Cloud Machine Learning Engine the best platform for running TensorFlow programs? What I love about Google Cloud, is how the entire data and ML platform is serverless and designed for data processing and machine learning at unimaginable scale and power. It just works. Give me a Jupyter notebook and let me train and deploy models on clusters of machines, with or without GPUs, from my notebook. I don’t need to know how to handle the case that one of the machines in the cluster fails half-way through. Or to go through a complex procurement process to buy a machine that will sit unused 80% of the time. I don’t want to install software, configure virtual machines. Machine learning engine frees up developer resources to focus on the code. What advice would you give to someone interested in pursuing a career in machine learning? Keep learning and build stuff. Build stuff that works. Nothing speaks louder than working code. Learn more about the full suite Google Cloud learning programs on Coursera and enroll today.